In 1738, he heard a reading of Luther's preface to the Epistle to the Romans, and penned the now famous lines: "I felt my heart strangely warmed". This revolutionized his ministry Wesley wrote many books about Scripture and the Christian life. 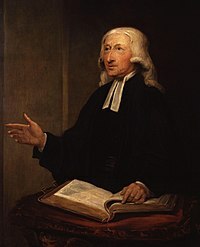 John Wesley's brother Charles Wesley helped him with many hymns he wrote. ↑ Thorsen, Don (2005). The Wesleyan Quadrilateral. Emeth Press. p. 97. ISBN 1-59731-043-333 . ↑ Koontz, Terri; Mark Sidwell, S. M. Bunker. World Studies. Greenville, South Carolina 29614: Bob Jones University Press. ISBN 1-59166-431-4 . ↑ Johnstone (2003). Users and Abusers of Psychiatry: a critical look at psychiatric practice. Routledge. p. 152. ISBN 0-415-21155-7 . This page was last changed on 4 October 2014, at 10:04.